Ukrainian An-72 at the Farnborough Air Show. The Antonov An-72 (NATO reporting name Coaler) is a transport aircraft developed in the former Soviet Union. It was designed as a STOL transport and intended as a replacement for the Antonov An-26, but variants have found success as commercial freighters. The An-72 first flew on 22 December 1977. Produced in tandem with the An-72, the Antonov An-74 variant adds the ability to operate in harsh weather conditions in polar regions. Other An-72 versions include the An-72S VIP transport and An-72P maritime patrol aircraft. 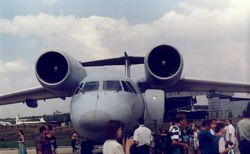 An unusual design feature of the An-72 and An-74 is the use of the Coandă effect to improve STOL performance, utilizing engine exhaust gases blown over the wing's upper surface to boost lift. The first flight was made in August 31, 1977, but it was only in the 1980s that production started. The power plant used is ZMKB Progress D36. The An-72 bears a resemblance to an earlier aircraft, the experimental Boeing YC-14. Boeing may introduce the An-72 as a new option for the United States Army's pending Joint Cargo Aircraft (JCA) competition. Were Boeing to offer it, the An-72 would be the only turbofan-powered aircraft in the competition. The An-72 is often called cheburashka by Russians because with its large intake ducts located close to the fuselage, it resembles cheburashka, a very popular animated creature in Russian cartoons. In August 2006 a total of 51 Antonov An-72 and Antonov An-74 aircraft remain in airline service. Major operators include Badr Airlines (3), Air Armenia (3), Enimex (5), Gazpromavia (12), and Shar Ink (8). Some 17 other airlines operate smaller numbers of the type. This page was last edited on 5 March 2007, at 14:20.